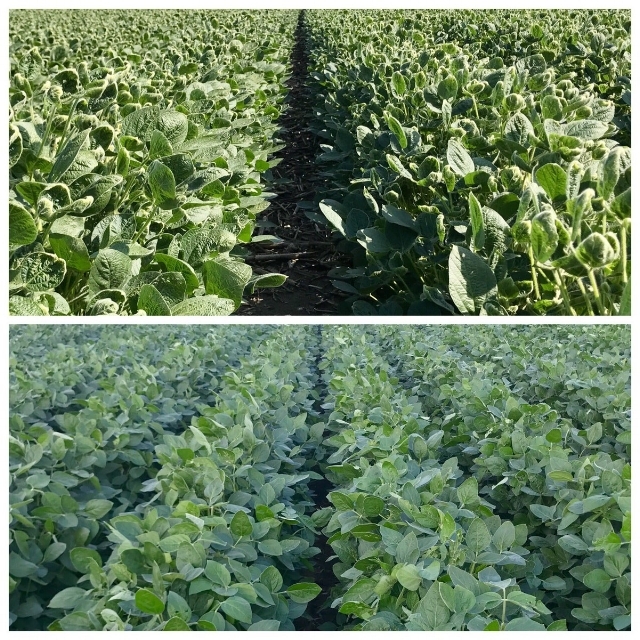 Farmer Jeremy Wolf's before (bottom) and after (top) pictures of one field suspected of dicamba damage. Off-target chemical application can produce strange patterns in fields. Some areas are not damaged, some are very damaged, and some are nearly dead. I’ve heard people say this unusual pattern will make it nearly impossible to prove yield damage in a field was attributable to dicamba drift. That might have been true in the past, but farmers with detailed scouting reports and accurate yield maps this season will disprove this. Overlay a map of plant tissue after off-target application with a map of yields after harvest.. If decreased yield corresponds with the areas affected by off-target dicamba damage—then the answer is pretty clear. Chemical drift caused the damage. Likewise, if it is true that moderate dicamba drift will help the yield on non-dicamba tolerant beans this fall—I’ve heard this many times this summer—the yield map will show this correspondence. Climate Corporation's data will be able to prove this by this fall, if it is true.